· The system has a field computer which acts as a sonic sensor for each test point and also calculates & displays the tomogram – so no need for a laptop on site. · The system can be supplied with either one or two 6 sensor cable looms – being the PICUS 3-6 or PICUS 3-12 systems – which are very quick to deploy/recover. Also included is the PICUS Radio Hammer with Display (PRHD) which enables up to 24 test points to be used with the PICUS 3 field computer. More test points are possible if the field computer is linked to a laptop on site via Bluetooth. The sensor cable looms are each 3.5 metres long – 0.5m lead in cable & then 0.5 m between each sensor connector. · Data collection is very quick with the PICUS 3 as signals are analysed faster due to state of the art electronics & the new Q74 software supplied. A 12 sensor PICUS 3 test can be completed in only ~15 minutes, a significant reduction in time compared with previous PICUS systems. · The PICUS 3 also has a 3 point rapid test function which enables the tree to be quickly scanned to ascertain whether a full PICUS test is required. 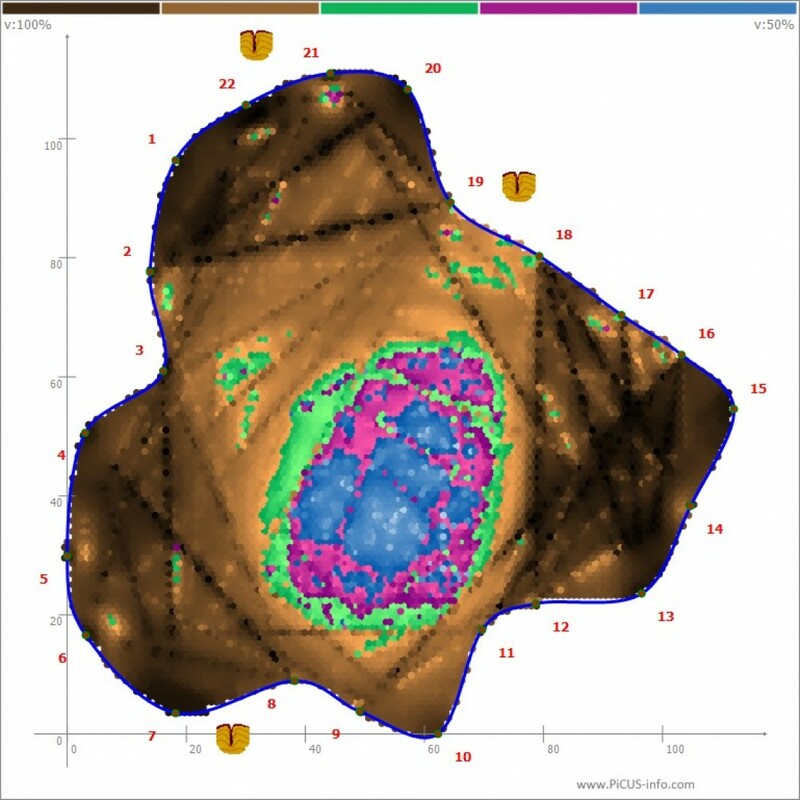 · The PICUS 3 software enables tomograms to be created in real time before all the test points have been used. 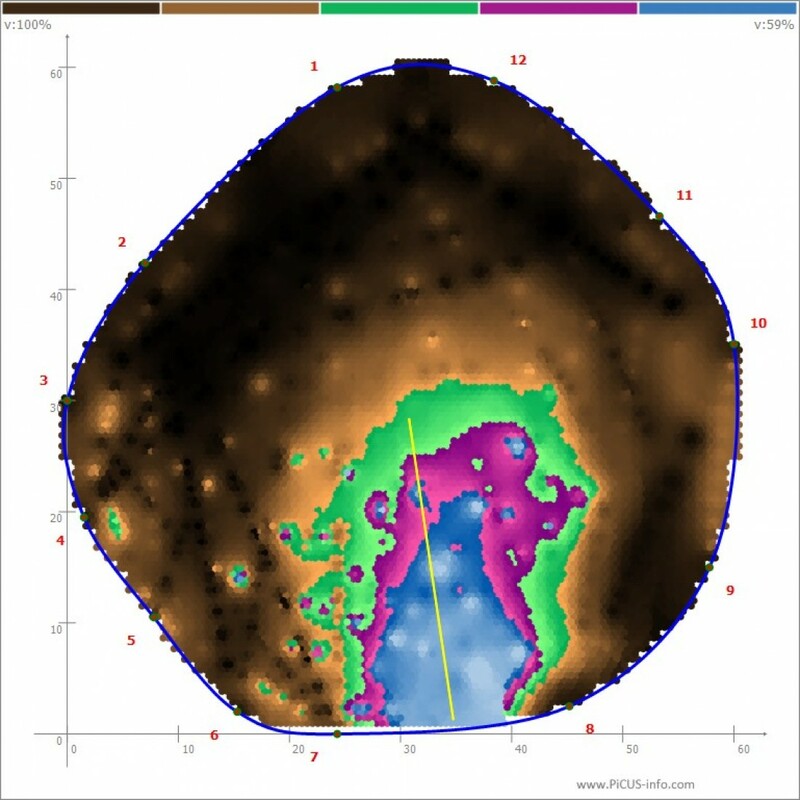 For example, once the system has enough viable data to produce a tomogram it will display a preview of the tomogram on the field computer. The preview allows a decision to be taken as to whether to proceed with all the remaining test points or – if the preview indicates the tree is in much better condition than expected – whether to terminate the testing procedure. Time on site can therefore be significantly reduced.